Duong Thu Huong is one of Vietnam’s most important writers. Since I haven’t read a lot of Vietnamese novels I was looking forward to reading her most famous book Novel Without a Name – Tiêu thuyêt vô dê. I wasn’t disappointed. It’s beautiful and harrowing. At the beginning, Quan, the narrator, is sent on a mission to find his friend Bien. Quan, his commanding officer, Luong, and Bien have grown up together. When Luong hears that Bien has gone mad, he sends Quan to go and find out if it’s true. What follows is the account of a dangerous mission on which Quan meets many people, dead and alive, sees atrocities, remembers his childhood, falls dangerously ill, dreams about his love, and finally finds his old friend. Bien stands for many other “crazy” men we meet in this novel. Some really go mad because of the horrors they have experienced, others just withdraw into themselves, trying to escape the war. Quan and his younger brother, who has been killed, have signed up right at the beginning of the war, ten years ago. Their father was one of those who supported a 100% mobilization, accepting that he might lose both of his sons. Almost all of Quan’s comrades are dead. The main story follows Quan on his mission, but overall the book is more like a series of vignettes. In parts it reminded me of Tim O’Brien’s The Things They Carried. Without the metafictional elements. Duong Thu Huong uses a mix of very short and long chapters. Some are dedicated to what’s happening to Quan on his trip, some are childhood memories or stories from the war, otheres are just short, intense snapshots. What I liked best is how descriptive this book is. It speaks to the senses like not many others. It felt at times like watching a documentary on Vietnam. We read about the food, the flora, the fauna, the beliefs, the scents, the way people love, sleep, cook. Several chapters describe the landscape and make you want to visit this country that has sun sets the color of chrysanthemum flowers. Duong Thu Huong served in the North Vietnamese army and so it’s not surprising the descriptions of combat, dead soldiers, the horror of war are drawn in a shockingly realistic way. She also manages to capture how tired and disillusioned most soldiers have become. The political slogans that fired them up and made them sign up have become mere empty words. Bodies pile up, their country is destroyed – for what? An ideal that isn’t even humane? On his quest, Quan meets many people. Simple farmers, single mothers, small girls, old men. They are drawn with a lot of detail and warmth. We suffer for these kind, gentle people who had to endure the worst for such a long time. It’s admirable that the author doesn’t blame the US. She finds a lot of fault with party politics and the false promises of the government. There is no evil enemy. Nor is there an army of faceless Vietnamese soldiers. Every soldier she describes becomes a human being with a history, feelings, wishes and hopes. 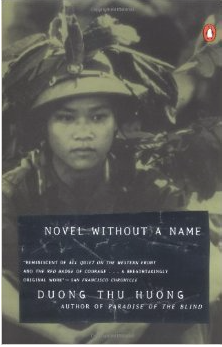 Novel Without a Name is a visceral account that doesn’t leave out any aspect of this war. It’s an insider’s perspective, a soldier’s account. The novel unrolls like a huge canvas, a painting of an abundant jungle, where humans butcher each other amidst the most beautiful scenery. I read the German translation of this novel that’s why I can’t share any quotes. It’s too bad because many of the descriptions are so amazing that I read them more than once. Novel Without a Name is the second book in the Literature and War Readalong 2015. The next book is the Hungarian Holocaust novel Fateless – Sorstalanság by Imre Kertész. Discussion starts on Wednesday 30 September, 2015. Further information on the Literature and War Readalong 2015, including the book blurbs can be found here. « Are You Ready for Mary Hocking Week? Wow! Wow! This is why I follow your blog. You always introduce me to such wonderful books that I would never find on my own. I just received my copy of the novel and am only about a quarter of the way into it, but already it is so…well, if I had to pick one word, I would say visceral. This is a perfect storm of a book. Not only are the descriptive elements richly painted and the characters so full-fleshed, but it gives an absolutely human face to complex political issues from a side that most of us (at least in the States) have never seen before. I have a much better understanding why many in the South Louisiana Vietnamese “immigrant” community are not able to fully put their war experiences into words. No matter the side chosen, this book is a testimony that war breaks everyone, that sometimes the wise can discern where the cracks are, but most can not even get a handle on the source of their pain, much less begin the long process of healing. Immense admiration for Duong Thu Huong that she is still fighting to piece back herself and her country. I’ll be posting some of my favorite passages on BoneSpark later in the week (or early next week depending on my schedule). TY again for the great recommendation. I will definitely pick up some of her other novels. Thank you so much for your kind words and for reading along. I’m glad you feel the same. I’m still pretty stunned. I thought it was amazing. Not sure I captured it so well. It’s so rich. I’ve read a lot of novels on wars but this one stands out. I think the way she wrote about this really opened my eyes as well. 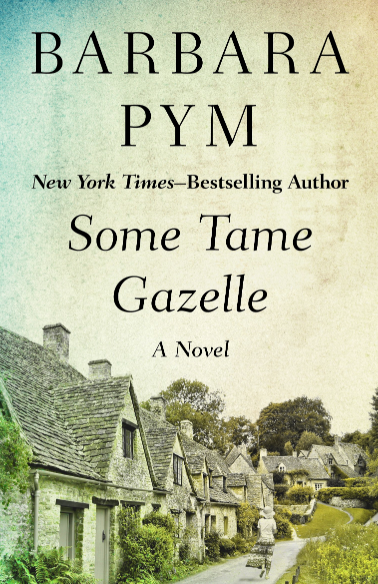 I have another of her novels and really want to read it. She’s ding so many things well. All the characterizatuons and the descriptions. Nonetheless – it has harrowing scenes. I’m looking forward to your post and will add it – so others get a chnace to read some quotes. This was another great pick, Caroline. I particularly liked how the love for the place (not the ideology) shone through despite the horror and the loss of innocence. I thought that this love made the book oddly hopeful, but I think it is because of what you point out… that the majority of the people Quan meets are gentle and kind and freely share what little they have left. I hadn’t thought of that before posting my review. I’m glad you liked it as well. I was hoping it would be good but I didn’t expect it to be this good. The love for the place is so strong. And the generosity of the people is so well captured. Nonetheless, we see th damage. The people are profoundly changed. I’ll head over to yours now. Great review, Caroline. I wasn’t sure if I’d be able to read this, but you’ve changed my mind. I love books that give such a sense of place and time. Friends who have been to Vietnam rave about its beauty and want to return. Thanks, Carole. It’s really worth reading although it has very sad parts. 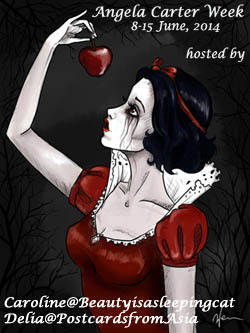 But it’s not as gruesome as some other books. I can imagine ti would be a great place to visit. I never thought of it before, but now I do. Great review. I love things with a strong sense of place which it sounds like this has. It also sounds hugely powerful. Thanks, Ali. Yes – it has a very strong sense of place. Not an easy read, but amazing. Hi Caroline, I am still reading the book and so just skimmed through the first part of the review. I am sorry, I haven’t been able to complete reading it on time for the readalong. I hope to finish reading it soon. I will then come back and comment properly. Glad to know that you enjoyed it so much. The descriptions are really beautiful as you have said. Maybe I will leave some quotes on your behalf 🙂 Thanks for including this beautiful book in this year’s readalong. I’m looking foward to your review – but take your time. It would be great if you left some quotes. There are some stunning passages in this book. Superb commentary as always Caroline. This sounds like such an important novel. Here in the United States we have a lot of exposure to both fiction and non fiction accounts of this war. Though these accounts are often highly critical of American involvement and behavior in the conflict, they are usually told from an American perspective. It seems that a book like this would be valuable for many in the West to read. Thank you, Brian. I couldn’t agree more. It’s an eye-opening novel on many levels. And it’s amazing that she doesn’t leave out any aspect. It felt like we saw the war from everyone’s point of view. Civilians and soldiers. And it’s quite different to read an accout from the perspective of those whose country was ripped to shreds. It is one thing to go to a war in another country or to have it in front of your door. It made me think of France and Belgium in WWI and how the land was destroyed. It does. When you read the beautiful descriptions in this book it sounds all so absurd. Yes and now there’s quite a business in mail order brides too. I haven’t met any Vietnamese here at all. Thai women, yes. Many. The ugliest guys come hime from a holiday with a young woman. Great review, Caroline. This sounds like a book with much to say about humanity, not only the brutal side of human behaviour but acts of compassion too. I’d never heard of this author before – I wonder how widely known she is outside of Vietnam? Thanks, Jacqui. She’s very widely known in France. the other book I have is a french translation. I think at least ten or more of her novels have been translated. Elsewhere – I don’t know. She’s highly appreciated in Germany as well. I’m pretty sure you’d appreciate her. Great review, it makes me want to read the book. It goes on the virtual TBR. It reminded me of WWI too probably because it was difficult to understand the purpose of the war. It’s easier for WWII. I’ll join you in September. Thanks, Emma. We’re lucky because most of her books have been translated into French. There seem to be a many that are just as good, even better. But I can really recommend this. You’d “like” it. I think the way she describes how the land is destroyed, really reminded me of WWI – and yes, the futility of it all. I’m looking forward to the September discussion. This sounds really good and very even handed–something that can be really hard to do in war literature. I think I needed a little break from war books–harrowing stories can be good but so heavy, too. I’m not sure I’ll manage the next book–though I would love to read some Hungarian lit–but we’ll see how the summer goes. My reading has been so weird but I think it is slowly getting back on track. Sometimes you jut need a break from the usual, which in a weird way I think I have been doing. I was tired of war litertaure as well that’s why I only chose four books. But this one’s really fantastic. She’s written other books that deal more with the aftermath – if you’re ever in the mood for Vietnamese literature you should try her. The sense of place is terrific and her characterizations stand out.